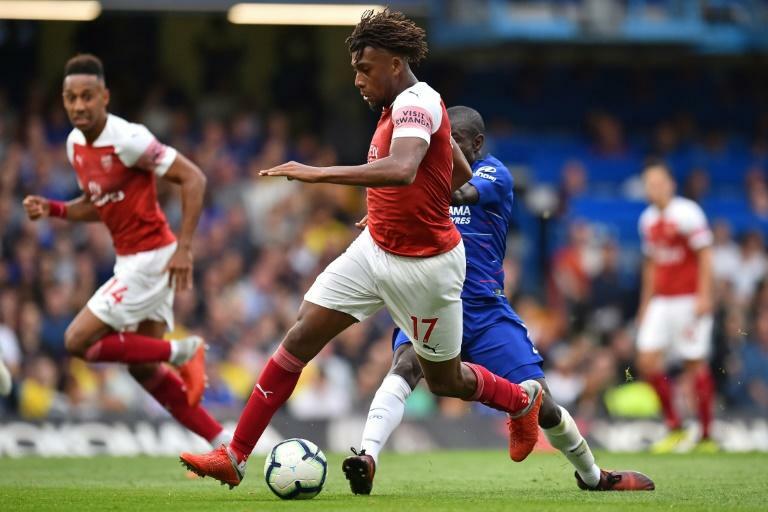 Nigeria and Arsenal winger Alex Iwobi opened his 2018/2019 English Premier League goal account at the weekend, but could not prevent a 3-2 loss at London rivals Chelsea. The Gunners might have avoided a second straight league defeat had 2015 African Footballer of the Year Pierre-Emerick Aubameyang from Gabon not fluffed several scoring chances. Algerian Riyad Mahrez, who succeeded Aubameyang as African Footballer of the Year, made an impressive but goalless home debut for Manchester City in a 6-1 rout of Huddersfield. Iwobi scored with a clinical close-range finish, but missed a chance to put the Gunners ahead and Chelsea took full advantage. Marcos Alonso's late winner left Arsenal to rue a second successive defeat under new boss Unai Emery. The striker endured a dismal afternoon at Stamford Bridge as his misses contributed to Arsenal's defeat. Aubameyang should have equalised after Chelsea's opening goal, but fluffed his lines with a woeful close-range miss. After Arsenal had battled back to 2-2 from two goals down, Aubameyang misfired again from close-range. The Algeria winger made his home debut for the Premier League champions in their demolition of Huddersfield. Mahrez arrived from Leicester in a £60 million (67 million euros, $76.5 million) move in the close season and made his first appearance in the Community Shield win over Chelsea at Wembley. Mahrez finally got to play in front of the City faithful at Eastlands when he came off the bench as a 64th-minute substitute against Huddersfield. Although he did not get on the scoresheet, he impressed for dominant City. Ghana internationals Wakaso and Twumasi were both in the squad for Alaves' tricky trip to Barcelona for the La Liga season opener. Wakaso was part of a four-man midfield as the visitors attempted to snuff out Barcelona's attacking threat and it worked for over an hour until Lionel Messi inspired a 3-0 win. Wakaso had one shot blocked while winger Twumasi, signed from Astana, had to watch from the bench as an unused substitute. Ivorian midfielder Fofana got his first goal of the season, scoring the equaliser as Udinese completed a comeback from two goals down to draw 2-2 at promoted Parma. Fofana, 23, scored four minutes after teammate Rodrigo De Paul had pulled the northeastern side, who narrowly avoided relegation last season, back into the game. It was his ninth league goal in his third season with the club. Ghana midfielder Asamoah began life as an Inter Milan player with a 1-0 defeat to Sassuolo after six years at Turin giants Juventus. The 29-year-old had appeals for a spot-kick waved away after being brought down by Francesco Magnanelli. Boateng played an important role in his new centre-forward role after moving to Sassuolo from Germany during the close season. "Proud of my team and so happy to be back," tweeted the 31-year-old former AC Milan player after the win over Inter Milan. Boateng thought he had made it 2-0 for the side from Modena after 65 minutes but his effort bounced off the post. The Le Mans-born Gabon winger scored his first goal for Nimes since arriving from Lorient last month and the first for his new employers in the top flight at home since 1993 in the 3-1 defeat of Marseille. He also had a decisive role in the counter-attack that led to the second goal.